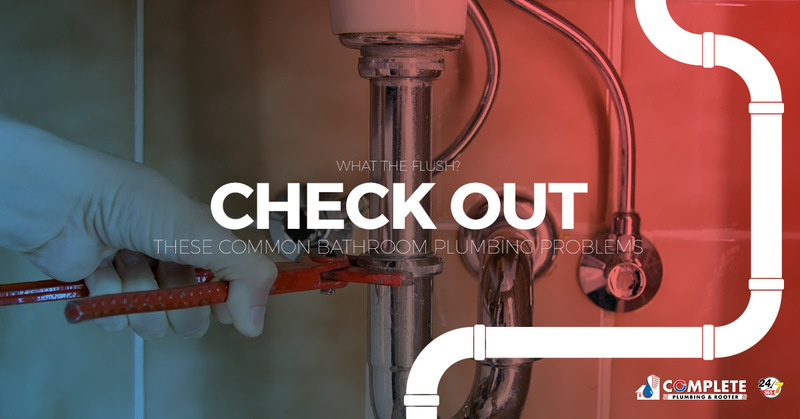 Plumbing Services Chino: What The Flush! Check Out These Common Bathroom Plumbing Problems! When it comes to plumbing problems, many homeowners experience issues in the bathroom. The bathroom, or bathrooms, of your home have the most amount of plumbing fixtures than any other room in the house. Ranging from minor issues like a slowly draining faucet to major issues like a toilet overflow causing flooding within a home, bathroom plumbing problems can quickly create a headache for homeowners if they aren’t taken care of promptly. The location of these problems can vary, too — from water-using appliances and fixtures to the pipes and drain pipes that we cannot see. In addition to the number of fixtures and appliances, bathroom plumbing problems are common due to the amount of use this room of a home receives. Eventually, daily use will cause wear and tear that will lead to issues. While most homeowners have a plumbing tool or two to deal with the most basic plumbing issues, there are some plumbing problems that will require help from a professional plumber in Chino. In this blog, we are going to look at the most common bathroom plumbing problems that homeowners face and how to fix them. A clogged toilet can be a nerve-wracking situation. Some toilet clogs can quickly be fixed with a plunger and some elbow grease, while other clogs can lead to a toilet overflow and help from a professional plumber. Most toilet clogs are caused by flushing something large down the toilet, such as an excessive amount of toilet paper. If you notice that your toilet is clogging fairly often, it could be a sign of root intrusion or a similar blockage. Clogged toilets are an unpleasant plumbing issue to deal with, but they are one of the most common bathroom plumbing problems regardless. Your bathroom drains are subjected to wear and tear as they are used on almost a daily basis. There are many culprits that can lead to a clogged drain, such as an accumulation of hair, soap, and other debris that hasn’t fully been washed out of the drain. Some drains can be unclogged with a plunger or a drain cleaning tool, but some clogs cannot be entirely removed without the assistance of a professional plumbing company. To prevent drains from clogging, be mindful of what goes down them. For extra precaution, use drain covers to catch clog-causing debris. While a leaky faucet is not a plumbing emergency, it is a pesky and annoying issue that should not be ignored. Even small faucet leaks can lead to serious waste of water. What’s worse, leaking faucets can also cause a lot of stagnant water to form, and if not drained properly it can cause structural damage over time. Since it can difficult for the most homeowners to determine whether a leak is due to high water pressure, a broken valve, or poor drainage, it’s best to call a local plumber to deal with the situation. A running or hissing toilet is not necessarily considered a plumbing emergency, but the noise can eventually get annoying and the constant running of water is wasteful and can potentially result in costly utility bulls. The last thing that you want is to be unable to flush your toilet because the tank just won’t fill up since the toilet is used just about, if not, every day. Running toilet water is typically caused by improperly fitted flapper valve. This valve is responsible for allowing water to flow from the holding tank to the toilet bowl. If attempting to flush a few times does not stop the water from running, take the lid off of the tank and see if the chain is tangled or if the float is broken. If there is no evident cause of the issue, contact a local plumber to perform a plumbing inspection and fix the issue. Another common issue homeowners face in their bathrooms is a drastic drop in their sink or shower water pressure. Any minor issue can cause low water pressure, and those problems should be repaired once noticed. Luckily, these problems are generally a quick fix. There are a variety of culprits that can cause decreased water pressure, such as a clog in the piping, a leaking or burst pipe behind the walls, or an accumulation of sediment deposits on your faucet aerators. To determine the cause of the issue, figure out if both the cold water and hot water are affected by low pressure. If both water temperatures are affected, try removing the faucet aerator, cleaning any debris or deposits, and putting it back in place. If the issue is still not fixed, it may be best to contact a professional. A lack of water in a bathroom is a problem that many homeowners experience. One thing is for sure, you don’t want to be without hot water during a shower. When water temperatures are inconsistent, it is generally due to a failed water heater or a damaged element in the fixture. Hot water tanks need to be maintained often since an accumulation of sediment can eventually bury the heating components inside the heater. When there is a buildup of sediment, it negatively affects the efficiency of the water heater, and if it is not cleaned properly, it can lead to rusting or other damages and may require hot water heater repair. In addition, plumbing leaks can also lead to a lack of hot water, so have a professional plumber perform a plumbing inspection. Out of all the rooms in a home, the bathroom is likely to be the most unpleasant when it comes to smell. In addition to smelling foul, sewer smells can be dangerous as it may contain high methane gas concentrations. These gases can lead to nausea, headaches, and other symptoms. The smell could be caused by poorly cleaned drains, clogged sewer drains, a dry shower trap, or a worn-out toilet ring. Most of these problems require an expert plumber to handle them since they will likely need to be replaced. An overflowing toilet can cause quite the mess. Luckily, they usually can be stopped with a few quick plunges. There are a variety of ways that toilets can overflow, such as not having enough water in the tank to create the appropriate siphon action within the bowl, the refill tube is not properly positioned in the overflow tube, causing the bowl not to fill, or the trap is calcified and could be catching toilet paper and other items flushed down a toilet, resulting in a bowl stoppage. If you notice that your toilet is getting clogged or overflowing more often than it should, there is a chance that there is a much larger problem down the line. If you hear the sound of knocking or banging pipes while you are taking a bath or shower, washing your hands, or flushing the toilet, you may have a serious plumbing problem. When these pipes are knocking and loud, it is a sign that the pipes in the bath are under pressure or have an unusually high water pressure. This pressure can cause the pipes to move, shift, and bend which can end up causing a significant amount of damage. It is best to call a local lumber to solve the issue as soon as possible. As you can see, there are a lot of plumbing problems that can take place in the bathroom. If you notice any of these plumbing problems in your bathroom it is essential to take care of them sooner rather than later to prevent further issues. If you are in need of plumbing services in Chino, CA and the surrounding areas, you can rely on Complete Plumbing and Rooter. Our team of local plumbers has the knowledge, experience, and equipment to handle all of your bathroom plumbing problems, as well as the other plumbing and rooter problems you may have. To learn more about our Southern California plumbing services, contact our professional plumbers today!